It's winter. Snow falls. Your breath rises frosty in the air. Bundled up beyond recognition, you find yourself longing for warmer regions. Arizona's Sonoran Desert would do nicely. Perhaps a trek through Namaqualand, South Africa. Not in the cards? Then, why not bring the desert to you? Create a little heat and drama right in your own living room with potted cacti and succulents. Succulents evoke glorious warmth, while ranging widely (and wildly) in form and texture from the bold, columnar magnificence of Cereus and euphorbias to the exquisite, flower-like forms of aeoniums, aloes and echeverias and the rounded shapes of mammillaria and rebutia cacti. Nolina recurvata (ponytail palm), a slow-growing member of the Agave family, evokes images of otherworldly landscapes, with its strange, swollen base and palm-like leaves. The slender leaves of Dasylirion longissimum arch to form a graceful fountain. Some succulents, like Sedum morganianum, cascade in voluptuous rivulets from hanging or wall-mounted pots. Viewed alone, succulents become minimalist sculpture. Grouped together, they mirror vast desert scenery. Leaf and stem colors range from the white and deep-green zebra stripes of Haworthia attenuata to the lavender-tinted leaves of striking, orange-blossomed Echeveria peacockii. Many cacti also produce startling flowers in saturated hues. An echinopsis cactus crowned with a show-stopping blaze of huge apricot or red-orange blooms is breathtaking. Succulents form a large group of plants with modified structures that enable them to store water and withstand drought. Special cells in their leaves, stems, or roots collect and hold water, releasing it into the plant when needed. Horticulturists use the term "succulents" to describe any of the many plants with these exceptional water-retaining properties. Many different kinds of plants—cacti, euphorbias, and agaves among them—are gathered under the umbrella term of succulents. The way succulents are potted can be the difference between success and failure. First, the pot you choose must be clean, have a good drainage hole, and should be in proportion to the size of the plant. Clay pots are ideal because they are porous, allowing the soil to dry out more quickly and the succulent's roots to get needed air circulation. Pots made from glazed ceramics, galvanized steel, and other materials will also work. Just remember that the soil in these pots will dry out more slowly, so you will need to water them less frequently. Next, choose the right planting medium. A good, fast-draining, nursery-bought cactus mix works well; regular potting mix doesn't drain fast enough. You can also make your own soil mix by blending equal parts of indoor potting mix with pumice, perlite, vermiculite, or coarse sand. The tools you need for repotting a spiny succulent are heavy gloves, a pair of tongs, and a rolled-up newspaper or bath towel to hold the plant in place while you are pouring soil into the pot. First, place one square inch or so of plastic screening (the type that's used to cover windows) over the drainage hole of your pot. Don't use broken pottery or rocks; they can clog the drainage hole. Next, scatter a handful of pea gravel over the bottom of the pot for extra drainage. Add soil mix one third of the way up the pot, pressing the soil lightly with your fingers without compacting it. Then, slightly tilt the plastic nursery pot housing your cactus or succulent and gently squeeze it, loosening the plant, root ball, and soil from the pot. Using the tools if you're handling a prickly cactus or heavy gloves for other succulents, lift the plant from the nursery pot. Brush a small amount of rooting hormone on the root tips. Carefully position the plant in the new pot and add soil up to the base of the plant, making sure not to bury any green. The succulent's base should be about an inch below the rim of the pot. Gently compress the soil with trowel or fingers. Cover with a thin layer of pea gravel to weight down the light cactus mix. Use a light brush to remove any bits of soil from the plant itself. Avoid transplanting a succulent when it is in flower, or it may lose its bloom. To grow succulents successfully indoors, it is essential to match the light requirements of the plants with the available light in the space where you choose to display them. Though most succulents need ample light, it is a mistake to assume they all can tolerate strong, direct sunlight. 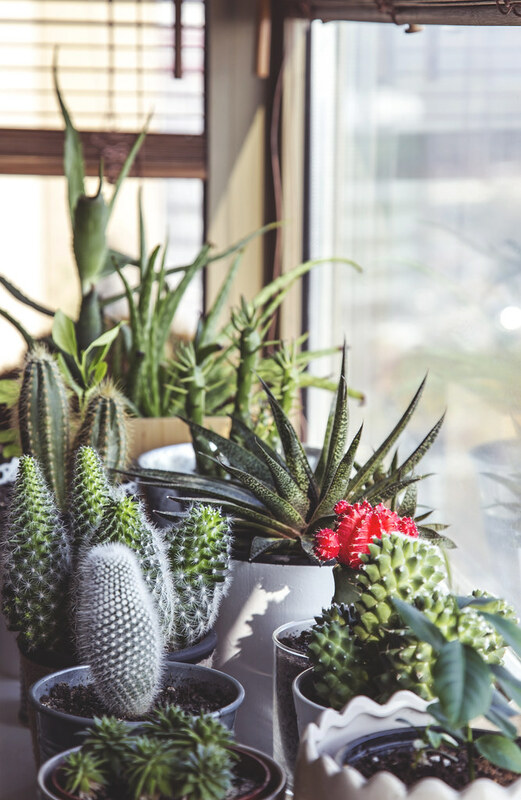 Some, especially cacti (with the exception of the epiphytic species), do require a full blast of sun for at least four hours a day, preferably from a south-facing window, but many other succulents thrive best on strong indirect light. If you're placing succulents in front of a window with southern, western, or eastern exposure, it's a good idea to use blinds to slightly diffuse the light, or display your plants a little further back in the room, away from the window. All plants grow toward the light. Succulents are no exception, so turn them once in a while to prevent a lopsided growth pattern, but be careful of sunburn to the previously shaded side. If you've got little or no sunlight, don't despair. Handsome sansevierias are the perfect choice for you. The snake plant, Sansevieria trifasciata, has stiff and erect sword-like leaves up to four feet long and three inches wide. The leaves are dark green with light green striping. Two other choices for lower light levels include Euphorbia trigona and Euphorbia lactea. Succulents can also be grown under Gro-lux fluorescent or HID grow lights placed about two feet above the plants. The key to watering cacti and and other succulents is restraint. Err on the side of too little rather than too much. Understanding how they behave in the wild may help you in this regard. Succulents have adapted to an environment with little water. Most receive rainfall only in a concentrated period of time during spring, when they put out slow, new growth and also flower. The rainy season is followed by a long, dry period in which the plants are dormant. With this in mind, water and drain your plants well during the period of active growth (usually spring and summer), allowing the soil to thoroughly dry out before watering again. Once a week is usually adequate. Succulents are adapted to handle some neglect, so an occasional two weeks without water won't hurt them. Taper off watering to once a month during fall and winter when most succulents are dormant. It is best not to water your succulent at least a week before and after transplanting. One effective way to test soil moisture is the "cake test method." Slide a narrow wooden skewer into the soil near the rim of your pot. Push the skewer to the bottom of the pot, then pull it out. If the skewer is dry, it's time to water. If the skewer is at all moist or if wet soil clings to the skewer, the plant doesn't need water. Always water thoroughly near the rim of the pot, keeping the water away from direct contact with the plant. Rather than using a dish to catch excess water, try watering them in the sink or bathtub, allowing the soil to drain thoroughly before replacing the plant in its usual location. If the succulent is too large to move, a dish may become a necessity. If so, water the soil a little at a time. Wait a minute or so, then repeat until a small amount drains into the dish. Absorb this excess with a paper towel. 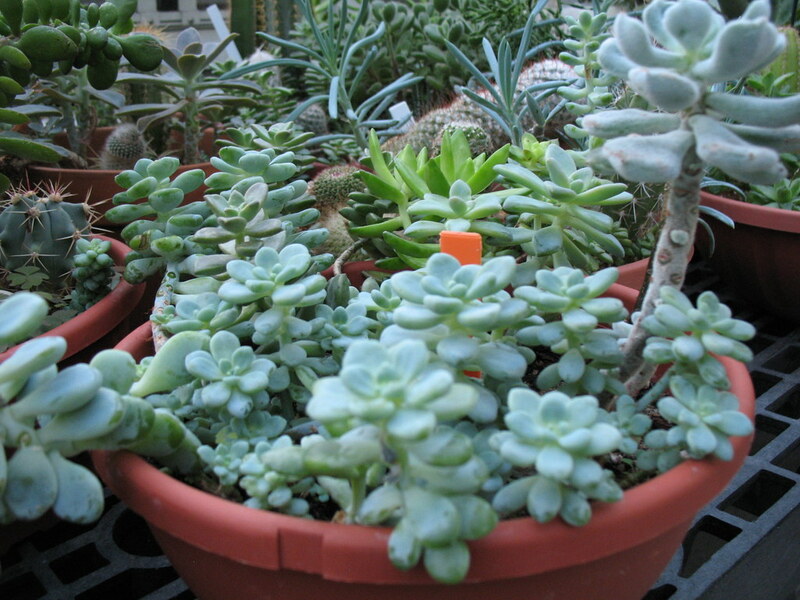 Indoors, succulents grow more slowly than outdoors, and they do not respond well to overfeeding. Unless the needs of a specific plant suggest otherwise, use an all-purpose liquid fertilizer diluted to one-quarter strength once a month during the growing season (usually March through August) and not at all in other months. Ideally, temperatures should mirror those in the deserts where most succulents grow wild: warm days (in winter your heater will do if it is not too close to the plants) and about a ten-degree drop in temperature at night for healthy growth and bud formation. However, succulents are forgiving and will tolerate some deviation from this pattern. Desert plants also need fresh, circulating air. Leave windows partly open at least part of the day during milder weather. Cacti and succulents work in any setting from casual to formal, Southwestern to East Indian. If you'd like an arrangement of cacti with a sense of humor and whimsy, try combining separately potted, hairy or spiny cacti in separate pots. Pair Mexican old-man cactus, Cephalocereus senilis, or peanut cactus, Echinopsis chamaecereus, and Cleistocactus strausii with bizarrely shaped cacti like Opuntia microdasys 'Crest' and the brain cactus Mammillaria elongata 'Crest'. Some indoor gardeners like collecting small, rare cacti for a windowsill display. These are a little more difficult to care for. Some examples of this type are any of the ariocarpus, small, rock-colored cacti with wart-like markings; turbinicarpus, tiny barrel cacti with soft, bent spines and white or pink flowers; and Astrophytum asterias, with its low, rounded, spineless body divided into eight flat ribs with small white flecks. Dish gardens are also captivating; a mix of small plants in one shallow container can recreate a desert scene on a small scale. The best choices for these containers are slow-growing succulents. It is wise not to combine cacti and succulents because of their different light requirements. A layer of shells or tumbled glass pebbles makes an attractive soil covering. Some people like to mix art objects with succulents. 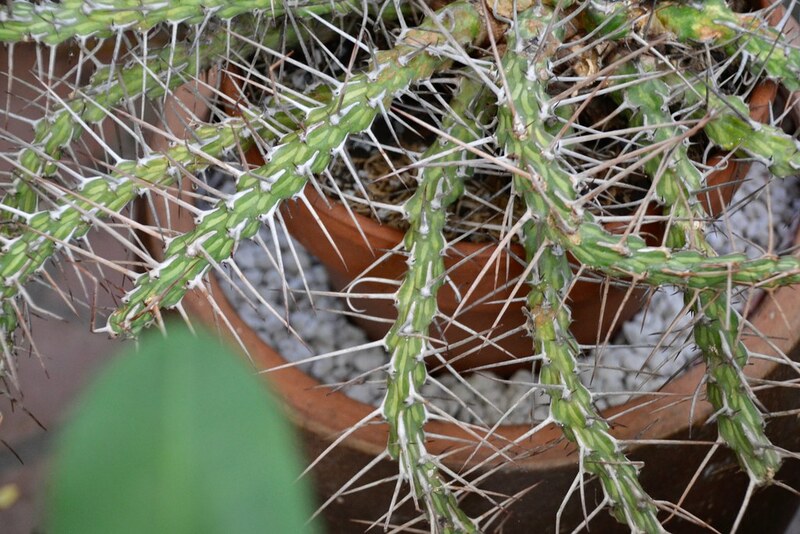 And, placed alone, bold Euphorbia grandicornis or Cereus with their exaggerated forms are as intriguing as any sculpture (though, because they grow so tall, you may be forced to prune them after a while). As far as design goes, the only rule is to choose succulents that perform well indoors and are grouped in a location that meets their light requirements. Julia Solarz is the editor of DIG, an award-winning bimonthly gardening magazine, published by the nursery Hortus in Pasadena, California. She grows potted cacti and succulents year-round in the courtyard of her Spanish-style, Hollywood Hills home, where the mild climate allows for such a luxury. Am currently a student of new york city technical collage of new york. My biogloy professor allow us to explore the BBG to see the beautiful flowers and surronunding they have to offer. thank you BBG staff for such a wonder ful job. Euphorbia kalisana in the Steinhardt Conservatory. Photo by Blanca Begert. Potted succulents. Photo by Milada Vigerova.